Owning a dog could be the key to reducing the risk of heart attacks and other potentially terminal diseases, according to a major new study. Scientists in Sweden have analysed the data of 3.4 million patients over an 11-year period and identified that the risk of death from cardiovascular disease reduces by 36% if people who live alone get a canine companion. Studying patients aged between 40 and 80, the researchers have found that people who live alone benefit disproportionately from having a dog around. 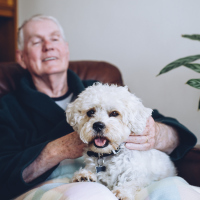 Although the benefits decrease for those who live with other people, pet ownership still offers a significantly lower risk of death from cardiovascular disease in households with multiple occupants. Tove Fall, senior author of the study and professor of epidemiology at Uppsala University, says owning a dog neutralises the effects of living alone. However, the professor is unable to say why the canines positively impact on health. "These kind of epidemiological studies look for associations in large populations but do not provide answers on whether and how dogs could protect from cardiovascular disease," she said. "There might also be differences between owners and non-owners before buying a dog, which could have influenced our results, such as those people choosing to get a dog tending to be more active and of better health." In October, Helen Stokes-Lampard, leader of Britain's GPs, issued a warning that loneliness could be as bad for health as chronic illness. She says there are an estimated 1.1 million lonely Brits, and that the risks associated with loneliness make it as harmful to one's health as diabetes. Anyone who has suffered from a heart condition can still enjoy holidays and trips abroad by taking out medical travel insurance.